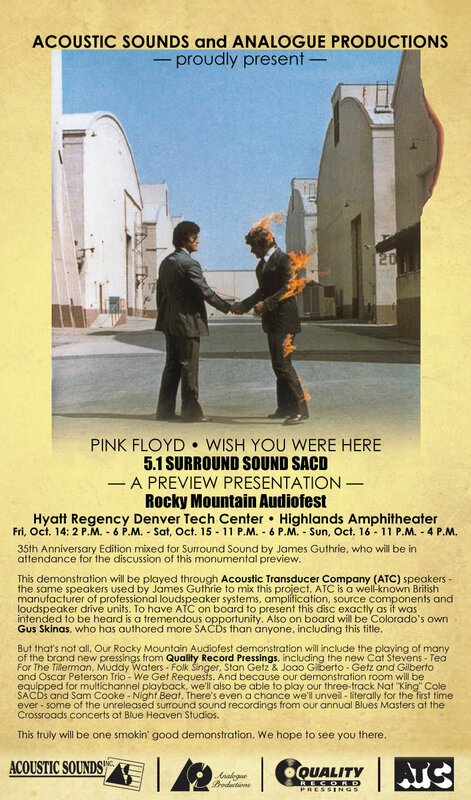 The 2011 Rocky Mountain Audiofest being held in Denver, Colorado, USA, next month includes a fascinating sounding event as part of its programme. On all three days of Audiofest - October 14th, 15th and 16th - James Guthrie will be participating in a "preview presentation" of the hugely anticipated 5.1 surround sound SACD (Super Audio CD), which finally gets its release on November 7th. Guthrie, who mixed the 35th Anniversary Edition, will be in attendance for the discussion of this monumental release. The demonstration will be played through Acoustic Transducer Company (ATC) speakers - the same speakers used by Guthrie to mix this project. More details of the event can be seen on the flyer (click the thumbnail) and also at audiofest.net/2011. Our thanks to Robert Perry and Panu Hallamaa for the info.